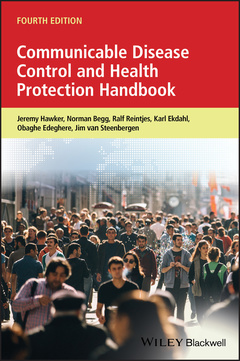 Communicable Disease Control and Health Protection Handbook Hawker Jeremy, Begg Norman, Reintjes Ralf, Ekdahl Karl, Edeghere Obaghe, van Steenbergen Jim E.
Authors: Hawker Jeremy, Begg Norman, Reintjes Ralf, Ekdahl Karl, Edeghere Obaghe, van Steenbergen Jim E.
Add to cart the livre of Hawker Jeremy, Begg Norman, Reintjes Ralf, Ekdahl Karl, Edeghere Obaghe, van Steenbergen Jim E.
The fourth edition of Communicable Disease Control and Health Protection Handbook offers public health workers of all kinds an authoritative and up-to-date guide to current protocols surrounding the identification and control of infectious diseases. With its concise, accessible design, the book is a practical tool that can be relied upon to explain topics ranging from the basic principles of communicable disease control to recent changes and innovations in health protection practice. Major syndromes and individual infections are insightfully addressed, while the authors also outline the WHO’s international health regulations and the organizational arrangements in place in all EU nations. Created to provide public and environmental health practitioners, physicians, epidemiologists, infection control nurses, microbiologists and trainees with a straightforward – yet informative – resource, Communicable Disease Control and Health Protection Handbook is a practical companion for all those working the field today. Jeremy Hawker Consultant Epidemiologist, Field Service, National Infection Service, Public Health England; Honorary Professor, Universities of Liverpool, Warwick, and Staffordshire, UK. Norman Begg Independent Vaccine Consultant; formerly GlaxoSmithKline Vaccines, Wavre, Belgium. Ralf Reintjes Professor, Epidemiology and Public Health Surveillance, Hamburg, Germany; Adjunct Professor, Infectious Disease Epidemiology, Tampere, Finland. Karl Ekdahl Head, Public Health Capacity and Communication Unit, European Centre for Disease Prevention and Control (ECDC), Stockholm, Sweden. Obaghe Edeghere Consultant Epidemiologist, Field Service, National Infection Service, Public Health England, UK. Jim van Steenbergen Independent Consultant; formerly Coordinator Communicable Disease Control, National Institute for Public Health and the Environment (RIVM), Bilthoven, the Netherlands.